In 1958, Marchand Creative Kitchens opened it’s doors on Magazine Street in New Orleans, and after three years, a change was on the horizon. 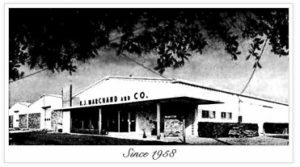 Recognizing the growth potential of Jefferson Parish, Marchand moved the business to its current address on Division Street in 1961. The company, originally selling all types of building supplies, over time evolved to specialize in Kitchen sales and design. This prompted the name change from Marchand Interior Specialties to a name that lets everyone know just who we are: “Marchand Creative Kitchens”. We are glad to have the opportunity to be a part of your new kitchen. Whether it’s your first home or your last, a “Marchand Kitchen” is a kitchen that is designed right… for your lifestyle, and your home. Contact us today. Have a question for Marchand Creative Kitchens? MARCHAND CREATIVE KITCHENS offers a superb selection of Sub-Zero and Wolf Appliances, along with outstanding Cabinets, Countertops and Specialty Products. With over 50+ years of designing beautiful kitchens, let Marchands help you realize the kitchen of your dreams.